Apple’s AirPods somehow manage to pack incredible sound quality into those tiny little earbuds. The problem is that most people don’t get to hear it because Apple’s design is flawed. The smooth plastic AirPods tips can’t keep a seal in your ear canal, so you get no sound isolation and all kinds of bass leakage. 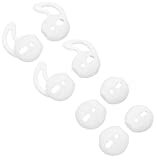 But the Rayker Anti-Slip Covers for Apple AirPods eliminate the issue by keeping your AirPods snug in your ears, and they have me using my AirPods again for the first time in a long time. Note that they have a bad star rating on Amazon right now because… people are not smart. Reviewers complained that you can’t put your AirPods in the charging case with the covers on. This is something that is obviously true of any AirPods covers you use, and most people are smart enough to realize that. Noise Isolating Design Reduces Ambient Noise for High-intensity Listening. Super-soft High Quality Silicone Reduces Earphone Irritation and Fatigue. Ultra Soft, Optimal Comfort & Great Sound !! !